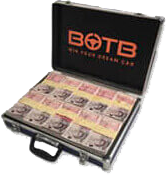 BOTB (Best of the Best Plc) was established in 1999 and has been located in major airports, shopping centres and online at www.botb.com. Every week someone is guaranteed to win their Dream Car. In the past 20 years, there have been over 450 winners, taking home over £25 million worth of prizes. Amazing range of over 150 dream cars starting from just 85p per ticket - quite simply, the "Best of the Best"
New lifestyle competition including prizes such as holidays, watches, gadgets, cash and many more. Playing online is easy - users only need to open an account to play in all BOTB competitions, giving people the chance to win the car they'd love to own, but maybe cannot quite afford or justify. The guaranteed winner of each competition is determined using a digital 'Spot the Ball' mechanism, which players enter as part of the ticket buying process. We encourage repeat visits and purchases by awarding Dream Car Credits and through our loyalty scheme - the Supercharged Club. Dream Car Credit is awarded for being close to the winning coordinates, giving significant incentive for future purchases. The programme now offers a 60-day cookie commission structure. This means that publishers can earn a commission on each new customer they refer to BOTB on all their transactions over 60 days. Commissions are paid out at 30% of the price of the tickets purchased. Please note that the free Superdrives competitions do not earn publishers any commission. * Extended brand: e.g. Bestofthebest.co.uk, botb.com, botb.co.uk, The Airport Supercar Competition, Best of the Best Vouchers, BOTB Vouchers, Best of the Best Voucher codes, Best of the Best discount codes, Best of the Best codes etc. In order to avoid any broad matching issues, affiliates should add Best of the Best and BOTB as a negative keyword in all paid search activity. Affiliates should also not use the Best of the Best trademark in any paid search activity, whether this is in ad text, title or display URLs. Please do not use "TM" or the word "Official" in your advertisements. BOTB also operates a strict policy on any paid social media advertising (Facebook, Instagram, Twitter etc) and affiliates must NOT set up paid ads to promote the BOTB brand or use BOTB keywords (as detailed in the examples above). Organic posts on social pages are absolutely fine. Affiliates are not allowed to set up websites to use in conjunction with their own BOTB accounts. Any affiliate who is found to be using the affiliate programme to earn commission on their own transactions will have their BOTB accounts closed and will also be removed from the affiliate programme. Affiliates are not permitted to send any unsolicited email ("spam") under this Affiliate programme. If affiliates wish to send out an email on behalf of BOTB to their database, they must seek prior approval from Affiliate Window/BOTB. Affiliates should ensure their websites, social media and other digital activity in no way passes off or impersonates BOTB. Failure to comply with these Terms and Conditions could result in removal from the programme and the retrieval of commissions.